For the second time in under four years, the City of Seattle has released a final environmental impact statement on a multipurpose arena plan. The difference why this latest project will likely proceed has little to do with the environmental study and everything to do with the KeyArena project pursuing an NHL team. Three years and four months ago this week, the reality of the National Hockey League coming to Seattle leapt forward in a way few appreciated at the time. The day a Final Environmental Impact Statement (FEIS) was released on a proposed new arena for our city’s Sodo District, then-Mayor Ed Murray warned that its proponents should switch to an “NHL-first’’ model. “Folks have got to come up with a plan that’s viable for us to finalize this process,’’ Murray told me. That he’d sound that alarm the day his administration was otherwise hailing a “major milestone” FEIS should have, in hindsight, been taken far more seriously. 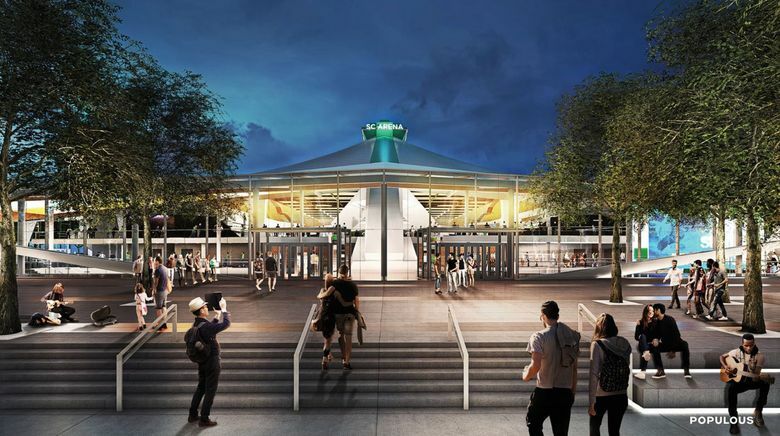 Fast-forward 40 months, our city last Thursday released another FEIS and this time it’s not for the Sodo project, but a $700 million overhaul of KeyArena with an NHL-first goal. The fanfare accompanying this latest hundreds-pages-long document was virtually nonexistent, a whisper compared with the May 7, 2015, announcement on the Sodo version. By now, everybody following this saga should have realized an FEIS isn’t sacred scripture by which arenas get built. An exhaustive, state-required document, sure, but no substitute for money and teams needed to get arena steel sprouting from the ground. What doomed the Sodo project had nothing to do with its FEIS; or the subsequent Seattle City Council vote in May 2016 denying entrepreneur Chris Hansen part of Occidental Avenue South to complete his arena land requirements. No, Hansen’s five-year Memorandum of Understanding with the city and county became moot 10 months before that vote when he stuck with an NBA-reliant deal for up to $200 million in public bond funding instead of going NHL-first with more private money. With the NHL all but pleading with groups here to make expansion bids by a July 2015 deadline, none did. Instead, the NHL chose a Las Vegas bid, which begat the Golden Knights, while keeping a spot for a 32nd team once our city got its act together. We are closer to an NHL team – and NBA franchise after that – than at any point the last five years. It has nothing to do with this latest FEIS and is all about money and pursuing the NHL. The Los Angeles-based Oak View Group, headed by Tim Leiweke, gave the city financial guarantees he’ll start construction right after the council signs off. That’s expected within weeks, regardless of what happens with an NHL expansion bid by a Seattle group run by Leiweke’s brother, Tod. But that bid – crucial to KeyArena revenue streams — will be heard by the NHL executive committee Oct. 2 and then, if approved, forwarded to the board of governors for a December vote on awarding Seattle a team. The NBA? It’s still not expanding or relocating. But we should have the equivalent of a brand-new arena when it does. Say what you will about Murray – and many have since he resigned in disgrace last year – but he’d met with NBA commissioner Adam Silver and his NHL-first warnings had logic. Silver told Murray, and later repeated, that no NBA team was likely coming before Hansen’s deal expired in December 2017. Without that NBA team, Murray and others knew in 2015 the Sodo plan was dead. But Hansen clung to his public-funding deal through the 2016 council vote, even when pressed by council members on how he’d land an NBA team, or replace the billions his former partner Steve Ballmer took with him to buy the Los Angeles Clippers in 2014. The council didn’t even want a vote, figuring it premature and that – even if it passed – Hansen was unlikely to secure the NBA team to start construction before his deal expired. Pushed to vote, they rejected his plan. Murray and others seized the opportunity to attract KeyArena renovation bidders lurking since 2015 and willing to go the NHL-first route. Hansen has switched to an all-private-funded Sodo venture that has gained no traction. His group still lacks financing to operate an arena without securing teams and needs Occidental Avenue South to be vacated. More importantly, he’s no longer the only game in town. The city partnered with OVG, which will revamp public-owned KeyArena right away and has shown a route to teams. Finally, no city has attempted two concurrent, all-privately-funded arenas for NBA and NHL. Competition for concerts and additional revenue streams has long been deemed too fierce to make two such venues profitable. As for that FEIS, it offers mitigation solutions and expert guesswork on how traffic and infrastructure might look with an upgraded KeyArena. Just like the Sodo FEIS predicted how a new venue might impact Port of Seattle freight transportation. They both may be right. Or not. The Sodo FEIS contained a serious omission: dismissing the possibility, despite contrary new evidence, that KeyArena could be renovated without impacting a roof destined for historical protection. This KeyArena FEIS also isn’t perfect. The NHL Seattle group has said 40 percent of those making 33,000 season-ticket deposits live within four miles of the venue. And yet, the KeyArena FEIS doesn’t make use of that late-breaking information. It stuck with a prior draft model from last April that predicted future commute patterns based off the residences of those attending a college basketball game and charity tennis match. Like I said, an FEIS isn’t scripture. When the council votes to finalize KeyArena transaction documents, it will want to know two main things: Can OVG pay? And can it get teams? The council has been shown the money. And the NHL has gone as far as it can to convince everyone a team is coming. Otherwise, OVG wouldn’t be committing more than $700 million and the city wouldn’t be wasting its time on another arena plan not happening. This one is. And it has everything to do with the NHL and what’s happened – and hasn’t – since the last time an FEIS got local sports fans’ hopes up.